While staying in Los Angeles, are you looking to explore different parts of LA? As such a culturally diverse city, it should be no surprise that the city is filled with various cultural districts. Each district honors the history of Los Angeles and the role that diverse cultures have had in the creation of this city. Here are some different cultures that you can get to know when you visit these districts in Los Angeles. An excellent place to visit is the Japanese Village Plaza located in Little Tokyo. At this Village Plaza, walk through a pedestrianized area that is decorated in the traditional Japanese style. Amidst the stores are unique boutiques where you can purchase authentic Japanese goods as well as delicious bakeries selling authentic desserts and treats. Be sure to spot the famous Yagura Tower that stands tall at the entrance of the Japanese Village Plaza. Little Tokyo is also conveniently located near the Arts District in Downtown LA. Only a few blocks from Union Station in Los Angeles, you will find Olvera Street, a pedestrianized area celebrating the cities Mexican roots. If you have been craving Mexican food, one place that you can almost guarantee authentic food is Olvera Street. Order up some tacos and horchata and afterward get freshly made churros for dessert! After dinner, walk down the brick road and look through the various vendors selling Mexican trinkets and souvenirs. Olvera Street is also historically significant as it is the location of one of the oldest settlements in Los Angeles! Be a part of history and learn more about the city’s past at Olvera Street. 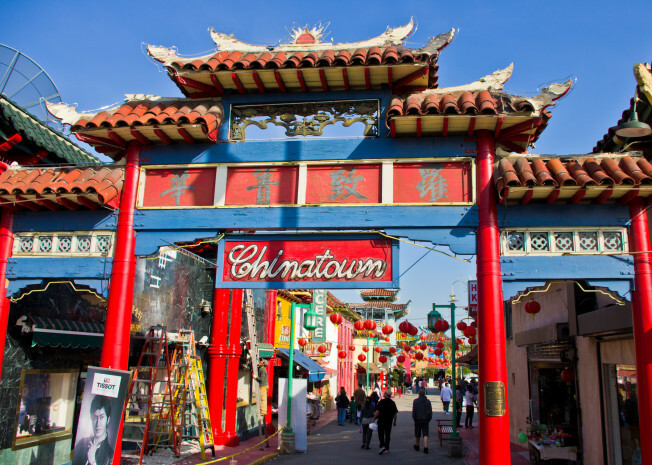 Chinatown is located near downtown and is easily accessible off of the Gold Line on the Metro. Be sure to take a picture with the iconic dragon Chinatown Gate, which is located at Broadway and Cesar Chavez. An exciting place to explore is the Thien Hau Temple. This Taoist Temple is dedicated to the goddess of the sea, and Buddha statues line the walls. The Old Chinatown Plaza is made in the traditional architectural style. Here, you’ll find beautiful paper lamps, small boutiques, and restaurants with the best Chinese food around. Make sure to check out any of these cultural districts. Go out and enjoy the great LA weather during your exploration!